Brainstorms are meetings where groups come up with ideas. They are the most effective way to break free from thinking within existing boundaries and give birth to revolutionary ideas. It’s actually these brainstorms that provide KAYAC with its driving force. All of the many new services and systems KAYAC propagates are born from our brainstorms. But that’s not all. This is something we’ve only recently realized ourselves, but these brainstorms also provide vital training for our members to acquire a habit of finding the element of fun in things. We assume most people would associate brainstorms with the golden rule “Don’t be negative.” However, after years of doing brainstorms at KAYAC, we’ve realized that rule isn’t really so significant. 1. When someone offers an idea, play with it. 2. The highest priority is to share as many ideas as possible. These two are the most important rules to brainstorms. Let’s explain them in more detail. To make things clear, a brainstorm isn’t a meeting for an individual to present ideas – it’s done as a group. Of course, sometimes it can be important for one person in the group to rattle out one idea after the other. However, when you’re the only one coming up with the ideas, it’s hard to break out of your box. You might come up with a fantastic concept for a project, only to realize you had the same idea 10 years ago. It happens more often than you would expect. A big difference lies in the fact that when you brainstorm, you are required to play with other people’s ideas, too. Somebody might quietly offer a mumbled idea, but you have to pick it up, face it with earnest, and, using that as your inspiration, add more ideas to it. If you do that, you’ll come up with ideas that you would never have forged from just your own thinking. That is what’s so good about brainstorms. As a footnote, people often have meetings where all of the participants use Post-it notes, but we’d like to state that we don’t recommend them. Each person ends up focusing on writing their own notes, and the number of times they go along with other people’s ideas decreases. That’s why at KAYAC’s brainstorms, we don’t use Post-its at all. The second rule is actually the most important. You mustn’t be mistaken about the following: the aim of a brainstorm is not to come up with good ideas, nor is it to decide which ideas you will actually develop. The biggest aim is to offer as many ideas as possible. It doesn’t matter whether the ideas are good or not. It’s all very simple – if the number of ideas shared in a meeting isn’t that high, it’s a failure. If you get lots of ideas, it’s a success. In order to do that, ideally, every single word that’s spoken should be sharing a new idea. “Questions” and “opinions” aren’t required at all. If somebody is going on and on about something, but at the end of the story, it’s not even an idea… They’re out! When you concentrate simply on achieving a high number of ideas, you’ll probably find you end up with a bunch of ideas that mean nothing, or would be impossible to realize. But even so, that’s okay. Please forgive our persistence in the matter, but the goal simply is to share as many ideas as possible. By the way, the rule “Don’t be negative” actually follows in the grain of our main aim. When you start to be negative, it makes it harder to share ideas freely. And please, try complimenting each others’ ideas, no matter what, no matter how. If you compare it to past meetings that have allowed negative comments, we’re quite sure you will feel for yourself how it certainly does help more ideas flow. So, what kind of effect will the above two rules have upon your team? By playing with others’ ideas, and complimenting each other, you begin to work better as a team. When you follow the rules, and play with other people’s ideas and compliment each other, for some strange reason, the level of teamwork increases. It doesn’t matter who is positioned where on the hierarchy, it helps to foster a more open relationship between superiors and subordinates alike. In the majority of cases, if the workplace isn’t fun, it’s thanks to bad interpersonal relationships. This means that as long as everyone gets along together well, you’ll be free of the majority of problems. Brainstorms work wonders in this regard. We would even go so far as to say it’s worth doing brainstorms for the improvement of in-house relations alone. At KAYAC we firmly believe the number of brainstorms we hold is directly proportional to the level of positive vibes within the office. 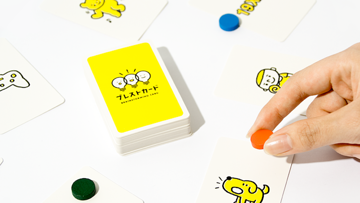 Even if someone comes up with an idea you find dull, try playing with that, too. You have to take every quietly mumbled little thought as a hint, and fight to see just how far you can expand upon it. If you keep this as your goal when you participate in a brainstorm, you’ll prove that, strangely enough, “Fun services are born from the most trivial of words,” all of the time. Once you experience something like that, you’ll realize for yourself that no statement is pointless, and you’ll also be able to trust the power of your team. Getting more ideas provides training towards a habit of finding the fun in things. This is something that’s a little hard to fully appreciate without experiencing it firsthand, but when you concentrate on sharing as many ideas as possible you’ll find that, for one thing, you can’t afford to waste time criticizing others. This is simply because you have to focus your thoughts on putting out more ideas. Let’s say you have a superior that you don’t really like. In normal circumstances, you’d just complain about what you don’t like about that superior behind their back, and that would be it. But by buffing up your “brainstorm brain,” you’ll start to think how you can change so that you don’t end up disliking them so much, or maybe how you’ll go about changing their personality for them, or maybe even start to devise a scheme to get that superior switched to another team, or whatever. It doesn’t matter exactly what you come up with. You’ll simply find you keep coming up with more ideas. Then you’ll find that you start to think like that in everyday life because it becomes natural to you. Once you’ve built that way of thinking into you, you’ll start to find the fun in everything in life, and truly become a more positive person. In addition, once a person has a pattern of thinking like that, we could call them a “creator.” For example, if there’s an issue within their company that needs addressing, they won’t just criticize it, they’ll naturally start to think of ways to solve the problem. Once they start doing that, we can indeed say they are part of the team that is actually creating their company. So, to put it short, you could say we use brainstorms at KAYAC to train people to find the fun in things and become creators. Indeed, at KAYAC, many of our new recruits don’t say a word at the first few brainstorms they partake in. However, after following our above rules regarding brainstorms and participating properly, every one of them starts to share ideas after about a year or so. Of course, not many people are able to come up with amazingly fantastic ideas. However, as long as you don’t worry about the quality of the ideas, it seems anybody can come up with something. The aim of a brainstorm is to share as many ideas as possible. In that respect, anybody can become an expert at brainstorming. In fact, we’ve even started to think that the process of coming up with an idea is, surprisingly enough, quite a mechanical function of the brain. Let’s try putting it in terms of soccer – somebody may not be able to trap the ball whatsoever the first time they try, but after a year of practice, although each individual’s skill level may vary, everyone will be able to trap the ball. That’s pretty much what we’re talking about. We value our corporate philosophy highly at KAYAC, and one way we look after it is by going on a camp twice a year with all of our members. The main purpose of this camp is to take time to reflect upon our corporate philosophy, but what we actually do there is nothing special – we simply brainstorm, all together, for a bit longer than usual, about the issues our company faces. The brain is like a muscle, and when you work out with heavier weights, it becomes that much stronger. That’s why when you brainstorm for a longer period of time than usual, your brain becomes even more of a “brainstorming brain,” and even more accustomed to finding the fun in things. On top of that, the issues we brainstorm about mostly concern the issues we have within the company, so the end result is that we find each and every one of our members truly performing as creators of KAYAC. In the page discussing our management philosophy we wrote about how, in order for the members of a company to find working there fun, it’s essential they are the ones creating it. If a company is still small, that’s something relatively easy to do – you’d be involved in helping the company grow from a stage where there are few existing rules, giving you more opportunities to actually create the rules. However, as a company gets bigger, you’ll probably discover somebody has already made all the rules for you, leaving you with fewer opportunities to become a rule maker yourself. That’s why it’s wise to brainstorm about the issues the company faces, as we do out our camps at KAYAC – it enables a company’s members to naturally start looking at things in the role of someone who is actually creating the company. Our first brainstorm and our final brainstorm. At KAYAC we’ve also established something we call the “First Brainstorm and Final Brainstorm” system. The “First Brainstorm” is a brainstorm we hold between our existing members and our prospective members before they join the company. By exchanging ideas about what they could do and how they could grow at KAYAC, our goal is to help form clear images of a) what it would be like for them to work with us, and b) what it would be like for us to have them. On the other hand, our “Final Brainstorm” is one we hold with members that have decided to resign, and we brainstorm about “What could’ve been done to avoid them quitting.” We hold this brainstorm because it’s an opportunity to make the company better, and we’d also like to maintain a good relationship, from both perspectives, between us and those who choose to leave. Lastly, we’d like to introduce a popular quote at KAYAC from a certain poet. When people get to a certain stage from which they can’t seem to make any more progress, they get stuck thinking, “I’ve run out of things I can try.” It ends up something serious because they truly think there’s nothing else they can do. If you ever think there’s nothing left you can do, you should just try coming up with a bunch of ideas, even if they’re completely impossible to realize. Each time you come up with a new idea, it means you’ve changed your point of view. When you look at things from a different perspective, they can be pretty silly and funny. You’ll also discover that as you come up with a bunch of ideas, you’re also creating some breathing space for yourself. And when all of this happens, you will definitely find a new means to get by. Please forgive the repetition, but as long as you don’t worry about the quality of the idea, then coming up with one is something anybody can do. We think that means everyone possesses the same number of options. It doesn’t matter if you’re extremely talented or totally tasteless, everyone has the same number of options available to them. So that’s why we come up with as many ideas as possible at KAYAC. And that’s why, in order to get those ideas, we hold brainstorms. However, we don’t just leave those ideas as ideas – we recommend that you also implement everything that comes to mind, no matter what. This means you’ll fail a lot too, but if you’re going to fail anyway, the quicker, the better. We value the act of failure so much, we even include in our bi-annual evaluation system a section that asks, “How did you fail in the last six months?” If you haven’t failed, that’s a shame – we interpret that to mean you haven’t challenged yourself. For The Fun-Loving Corporation to continue being The Fun-Loving Corporation, we must always be full of ideas. That’s why we at KAYAC truly are committed to brainstorms. 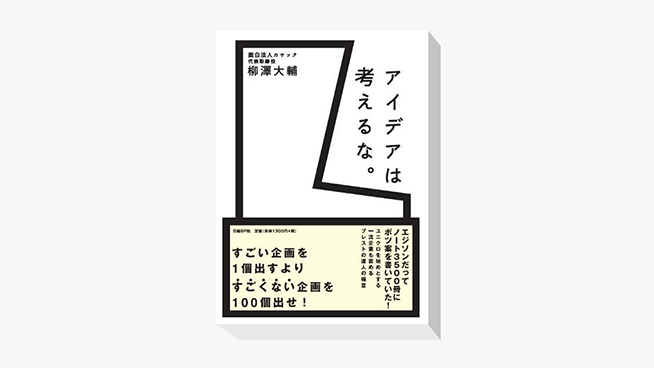 KAYAC CEO Yanasawa’s book “Don’t think about ideas” is about the secret enabling anyone to easily come up with ideas.